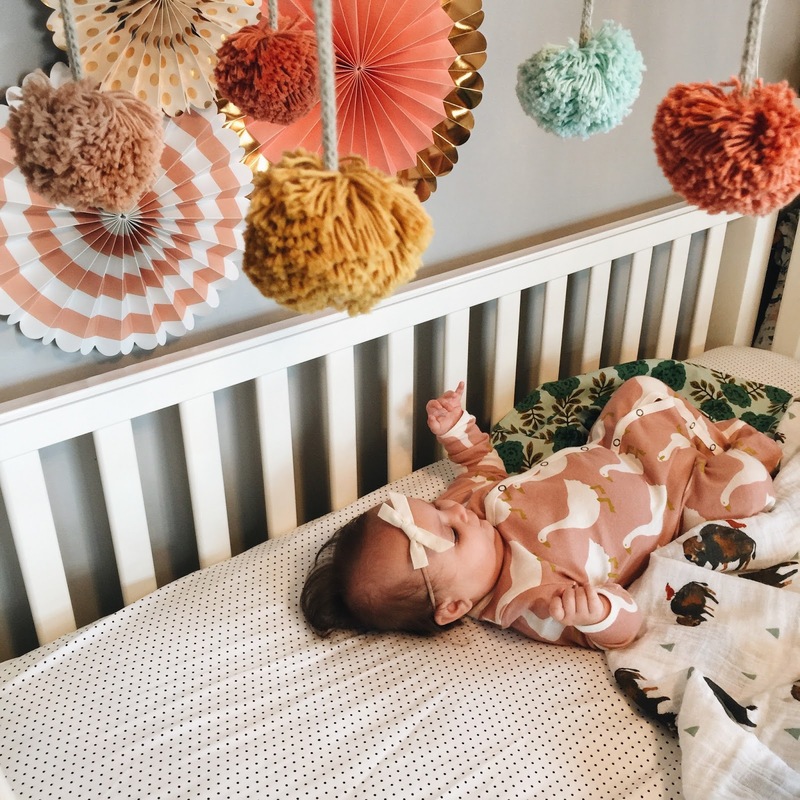 Penelope is just over 5 months and in the past two weeks I've done a lot of reworking & tweaking of her sleep schedule so I wanted to share an update with what naps & bedtime look like in our house and offer some tips from our friends over at The Cradle Coach, as well as a giveaway for a personalized sleep plan! From birth, Penelope slept in her bassinet. We have this one and absolutely love it; we were given it when I was pregnant with Olivia & of course saved it for our future babies. At first she slept in it in our bedroom (until about 2 months) and then in her own room. 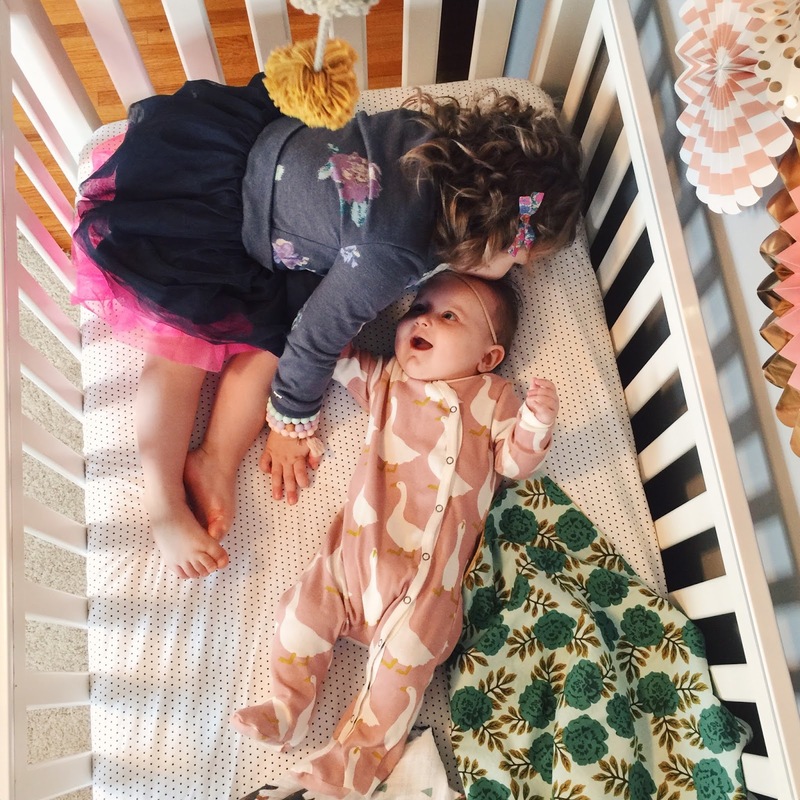 I shared an in-depth post here about how we successfully sleep trained both of our girls and a look at the methods we used to get them sleeping through the night by 8 weeks. Penelope hit the same sleep milestone as Olivia did at her age and was sleeping roughly 9pm-9am from two to four months consistently. Occasionally she would be up for a middle of the night (or very early morning) feeding but it was pretty darn predictable. Then, as you can imagine, four months hit & although we didn't experience the classic sleep regression for Olivia at 4 months, Poppy was a bit of a different story. She was still going to bed around the same time each night (between 9 and 9:30pm) but was waking a few nights each week around 2/3am for a feeding and then again up between 5:30 and 6:30am (aka too early). Her naps were all over the place and I never knew when I would get her down for them, how long she would sleep, or if I could double nap the girls to catch a break. I am definitely not my best self in the morning (or in the middle-of-the-night for that matter) and after 5 weeks of feeling completely exhausted (and a bit frustrated that it felt we were taking steps backwards), I was starting to wonder when and if Penelope would ever revert back to her old (and wonderful) sleeping habits. I got to talking with my dear friend Melissa of The Cradle Coach and sought out some advice on how to drop Poppy's middle of the night feeding, how to get her sleeping in a bit more in the mornings and how to tweak her nap schedule to be a bit better for all of us. I crossed paths with Melissa shortly after Olivia was born when I was asked to be a guest blogger on The Cradle Coach blog. Being a Mom of 3 and having had over 15 years of training and experience, Melissa founded The Cradle Coach and through it offers personalized professional one-on-one coaching (in person, by email, phone & more) to help babies and parents get the sleep they need. I often feel like sleep training is a term constantly thrown around and used in every which way but for a new parent (or even a seasoned one), I feel like it's often vague and something that few people actually understand. Melissa defines sleep training as "the time you as a parent take to focus on one consistent technique during a period of time to help give your child the ability to learn healthy sleep habits" -- she likes to use the term sleep process because it's gradual changes over time that eventually become habits. There are dozens of techniques but a few common ones and the books they're found in can be found here. (1) Move her bedtime up to 7:30/8pm so she can get into a deeper sleep earlier in the night, which is better for her body & mind. (2) Now that she is rolling over, transition her from her bassinet to her crib so she has the space she needs. She had been napping in her crib during the day but then still sleeping in her bassinet at night. If you haven't transitioned your little one from a bassinet or the place they originally slept as a newborn and feel its time to make the move (usually between 3 and 5 months), Melissa suggested doing it slowly over time. Start with naps for a week and then introduce it at bedtime a few times before fully moving them to 7 nights a week. Because she'd had so much time spent napping in her crib, I didn't really do it slowly, I just decided to nix the bassinet altogether but you can definitely do it over a period of a week or two if you feel your baby needs some time adjusting. (3) Stick to a consistent schedule. (4) Get a sound machine. This was something I had read about but never did with Olivia because to be honest, I was a bit skeptical. I didn't want to introduce one more thing to Olivia that she needed to get to sleep; I wanted her to be adaptable and be able to sleep anywhere with any amount of noise or lack thereof. But after thinking more about it, I figured it was worth trying this time around. Melissa suggested this one on Thursday while we were chatting and good ol' Amazon prime had it on my doorstep on Saturday morning. I absolutely love it and highly recommend it. I like that it has an actual fan inside and the volume + tone can easily be adjusted, versus a repeating sound that has a pattern and isn't necessarily soothing. If you are interested in hearing what it sounds like, you can YouTube a video (which is what I did before ordering). The first time we used it, Penelope napped from 2-6pm and I was sold. (Side note: I was a bit concerned her long nap would throw off her bedtime but she was still ready for bed by 8pm, part of that was because her morning nap had been only half an hour and I also think she is in the middle of a huge growth spurt). (5) For both naps and bedtime, darken the room as much as possible. This was something we were already doing for bedtime (we put room-darkening blinds in all our bedrooms when we moved in a few years ago) but sometimes it seemed silly to me to make the room super dark for naps since they were so short and during the day. After learning more about it, now I be sure to get her nursery as dark as possible whether its a 30 minute nap, two hour nap or full night of sleep. Here's why: the two main hormones that regulate sleep are cortisol and melatonin. During the day (with daylight), cortisol is naturally produced by your body. It is what keeps you feeling awake and alert. When the sun sets or you're no longer exposed to light (natural or artificial), your body begins producing melatonin. As melatonin levels rise, your body becomes less alert and sleep becomes more inviting and eventually, inevitable. If you're trying to get your child to sleep well (no matter the time of day), it helps if their bodies are producing melatonin. In a bright sunny room, their cortisol levels stay consistent and sleep is more challenging because of the lack of melatonin being produced. (6) Use the technique of controlled crying to drop the middle of the night feeding. In my previous sleep training post, I shared that we do a modified cry it out using a 15/15/feed method, meaning I would let Penelope cry for 15 minutes, then check on her without picking her up (reassuring her I was there but still giving her the opportunity to settle herself), leave for another 15 minutes and if she was still crying after the second set of 15 minutes, I would feed her. I used that technique in my initial sleep training but wanted a way to drop the feeding altogether (now that she is at a weight where she doesn't need it), not just delay it. Because I had already been doing 15 minute increments, I decided to stick with that, but if you use the controlled crying method, you can use 5- or 10-minute increments instead of 15. This is how it works: When Poppy wakes up crying in the middle of the night, I watch her on the video monitor and set my phone timer for 15 minutes. After 15 minutes, I go in to her nursery to calm her and reassure her without picking her up (same as before). You can offer your baby a pacifier (buuuuuut she has never taken one), put your hand on their stomach, reposition them, etc. The important thing is that they know you're there but you only want to stay in the room for less than 60 seconds. It should be very brief. Once you leave the room, reset the clock and start again. Once they begin pausing between cries, or their crying slows down for a few minutes at a time, stop going in. In theory, at that point they are close to falling back asleep. Melissa suggested continuing this up to 1.5 hours max, so I would go in a total of 6 times (90 minutes divided by every 15) before feeding her if she hadn't settled on her own. This gives babies adequate opportunity to settle and soothe themselves, getting themselves back to sleep without your assistance or any sleep aids (nursing, rocking, etc). You can utilize the same technique at bedtime in getting them down to sleep. We put Penelope down around 8pm, and let her cry it out, checking on her every 15 minutes. Sometimes she goes right to sleep without a peep. Sometimes she doesn't. Her very first night in her crib was the hardest, and I had to go the whole 90 minutes of listening to her cry/scream before I ended up feeding her. As their Mama, it is so hard to let them cry it out, but I wanted to stick it out because I knew in the long run I want her to be able to self-soothe. It was actually a really good thing looking back, since now I know that if she is truly hungry (I didn't think she was cause I had fed her around 7:30pm right before putting her down) she will not stop crying until she is fed. After feeding her, I put her back down (at this point it had been about two hours since she was initially put to bed so it was close to 10pm) and she fell asleep immediately. That night she woke at 3:45am and was back asleep within 15 minutes by herself, so I didn't even go in once. It's really a trial and error technique, as most things are with babies. If you're practicing controlled crying, you can modify it based on your babies needs, schedule, etc. The most important part is that you give them an opportunity to cry and the chance to settle themselves, but also remember that you're their Mama and its OK (and a good thing!) to follow your gut. If you think they're truly hungry, feed them. If you think they need a little extra cuddling, give it to them. They're only this little once, and as wonderful as sleep training is, I think a Mama knows her baby best and should react based on that, not just always on a set of rules or schedules. (7) Last but not least, I did a bunch more reading + research and really began to understand how babies sleep patterns' work, why most babies regress around 4 months (sometimes it is as early as 3 and sometimes as late as 5) and what causes the night-time waking. For me, not only as a Mom but also as an RN, I like understanding the why of a baby's behavior as it helps me better know the how -- how I can help them and how I can implement techniques that benefit them. A cause and effect sort of perspective. Have you ever noticed that a newborn can sleep anywhere, anytime, with any amount of noise or distractions in the background? Newborns often sleep all day long, only waking for short periods of time to eat. Once they hit 3-5 months, their sleep patterns shift from that of a baby to be more like an adult: it takes them longer to get fully asleep and they cycle between light and deep sleep through the night. "It’s at this point that sleep crutches – such as using a pacifier or being rocked or fed to sleep – might become a problem; what babies need to help them fall asleep at the beginning of the night they will often insist on getting every time they cycle out of a deep sleep – thus the night wakings. Think of it this way – how would you feel if you fell asleep in your cozy bed only to find yourself awake on the kitchen floor? Not fun! Sleep crutches have this “kitchen floor effect” on babies." 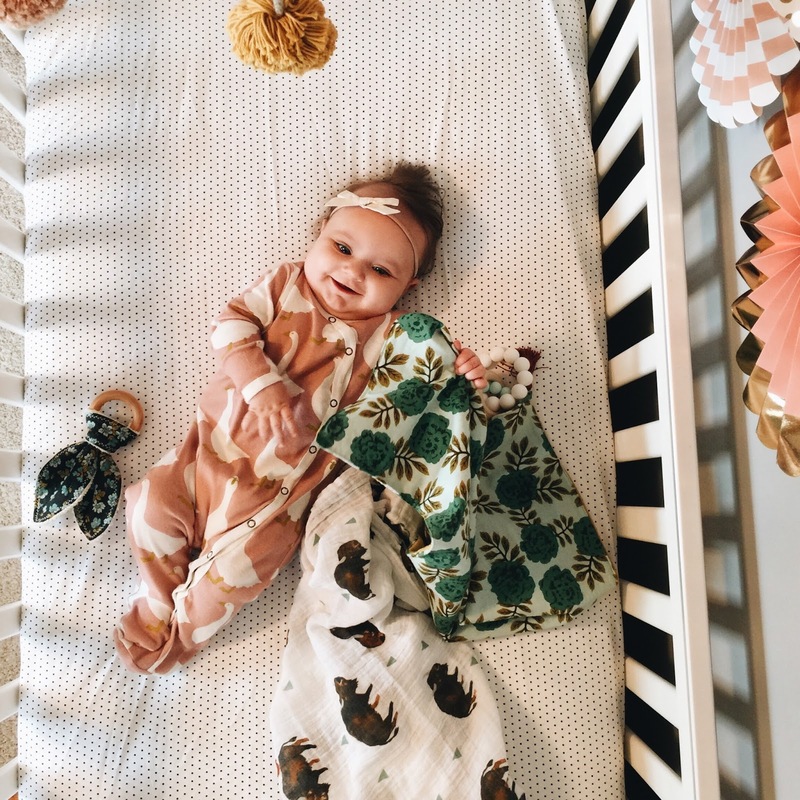 Because of that, Melissa suggests sleep training to help them fall asleep on their own without their sleep crutches: place them in their crib for bed drowsy but awake, so they learn to fall asleep without your help. She also suggests not introducing new sleep crutches...since Poppy hasn't ever taken a pacifier, I wouldn't try giving her one now to get her to sleep because then I'm just creating one more habit to break later. Make sense? Remember that babies will go through various growth spurts & developmental leaps, and this will more than likely throw everything off. Right now Penelope seems to be very tired most of the day, ready for bed by 7pm even if she just napped from 2-4:30pm, probably because she's experiencing a huge leap. Keeping a baby up too late (say even until 8/8:30pm when they're ready for bed by 7/7:30pm) will actually cause more frequent night waking and cause them to wake in the morning early. I've always wanted my girls to sleep in so logically I would think to keep them up a bit later, right? Melissa explained that the opposite is actually true and this goes back to the melatonin + cortisol regulation. If your baby is waking frequently in the night or super early in the morning, it may actually be because they're overtired, not because they're fully rested and ready to wake. By following their cues on when they're ready for bed (see overtired article below), you are able to put them down when their bodies need to rest even if it seems they just woke up. And when you experience a growth spurt, understand your schedule and sleep training plan will shift and thats OK. It's a learning process and can be frustrating but try to hang in there! You're not ever alone in it, even if it feels that way in the moment. There are Mamas everywhere going through the same things with their babies at the exact same moment! 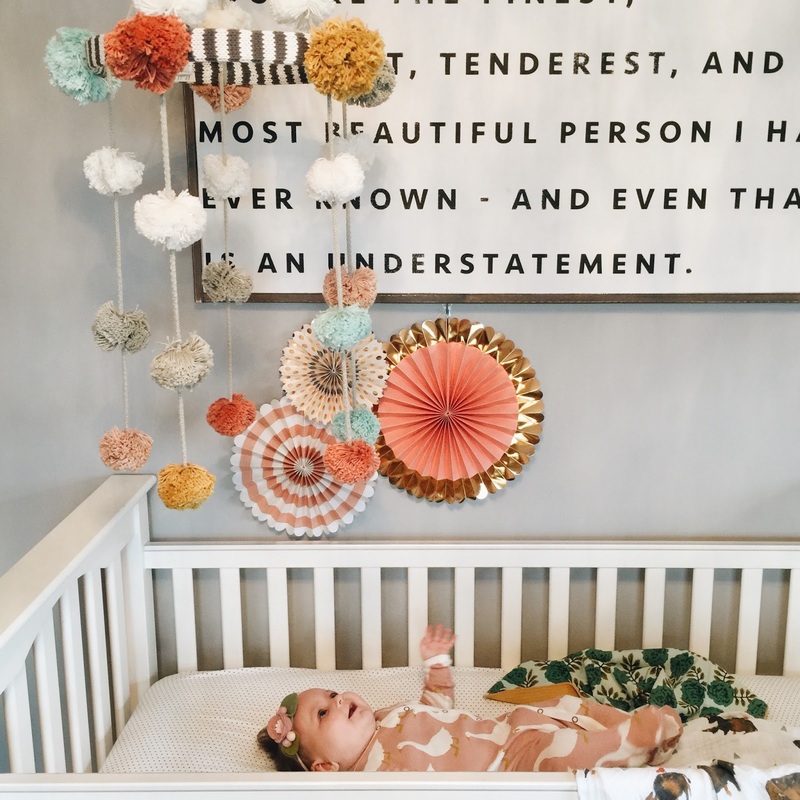 Finally, in addition to offering personalized professional sleep training, The Cradle Coach has an incredible blog full of helpful articles on every topic you can think of related to baby + infant sleep. If you made it through that entire post, kudos to you! I didn't intend to write such a novel but a lot of these points were ones I wish someone had told me when I was a new Mom with my first. There are so many great books and websites out there but I feel like all I really wanted to read about when I was in the trenches of sleep struggles with Olivia was another Mom's real life experience, someone I could easily understand and relate to. I hope in some small way this post helps you or encourages you. Thank you for sharing! My first is just 6 weeks old and I'm trying to wrap my brain around all this scheduling/sleeping stuff. He doesn't consistently nap but he sleeps well at night for a newborn so now I'm just trying to make day times more logical. Pray, saints! My daughter is just hitting that 4 month regression stage, which breaks my heart because we had a good thing going! But thankfully I read your post and found it to be very helpful. I was wondering though if you still feed P right after she wakes and then again right before her naps like on your last post? Just asking because I am also struggling with the timing of feedings now too. What do you think of something like Dock a Tot? It is a mini bassinet that you can keep in bed with you. Thanks. Thank you for sharing! I read the whole thing and then started from the top and it again. Our daughter is 3 months and this is definitely going to be helpful in our next learning experience.